The National Radio Astronomy Observatory is a service of the National Science Foundation. Green Bank, West Virginia, is the site of one of their facilities, the Robert C. Byrd Green Bank Telescope (GBT). This is about a three-hour drive from Bluefield, West Virginia, and it might make an interesting side trip while you are visiting Coalwood. Dedicated in 2000, the Robert C. Byrd Green Bank Telescope (GBT) is the most technically advanced single-dish radio telescope in the world. 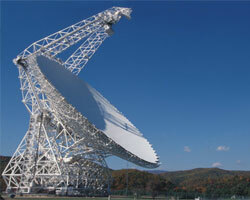 Its 110-meter by 100-meter dish boasts more than two acres of area for collecting faint radio waves from the Universe. Weighing 17 million pounds, the GBT is also one of the world's largest moving structures on land. And since it is located within the National Radio Quiet Zone, the GBT's sensitive receiving system is well protected from radio frequency interference. The GBT is a leader in the scientific study of pulsars, dense neutron stars that serve as laboratories in which astronomers study the physics of extreme states of matter and enormous magnetic fields. The GBT can also detect the fingerprints of atoms and molecules far into the distant Universe, yielding new knowledge about star formation, the structure and motions of gas in galaxies, and Nature's fundamental constants. The National Radio Astronomy Observatory’s Science Center offers visitors many opportunities to experience the elements of the Observatory and outer space. Visitors will enjoy the Star Lab, evening Star Parties, and high tech tours which are offered regularly. Take a moment to enjoy a beverage and sandwich on the Star Patio and look at the gorgeous countryside. Posters, games and other NRAO memorabilia are also available at their gift shop.